Meic Sullivan-Gould, a Past President of the Association of Council Secretaries & Solicitors, has ruffled a few feathers since becoming interim monitoring officer at Tower Hamlets council in January. I’m told he’s a great fan of Private Eye and that he believes he’s a real bloodhound when it comes to sniffing out town hall wrongdoing. He’s something of a travelling wilbury in local government circles. Councils queue up for his consultancy services, it seems. He must be the best thing since sliced bread. He’s an expert. In everything. Except keeping counsel as a good lawyer perhaps should. Within a few short weeks of of working in Tower Hamlets the white knight of local government was letting it be known there was nothing to investigate. He, Meic, had given the council and Mayor Lutfur Rahman a clean bill of health. Nothing to be seen here, you pesky journalists and opposition councillors; run along now. How he had managed to go through the books and processes of the council is such a short space of time, I have no idea. He must be superhuman. And so confident was he of his thorough investigation, he took to Facebook as the Panorama programme was airing on Monday night. The man he is chatting to is Mark Hynes, the director of law at Lambeth Council, who, significantly, is the President of the Lawyers in Local Government. So a heavy hitter. I’m not sure he’ll be most impressed about Meic’s privacy settings. I’m not sure “the Bengalis” is a term he’d like to use again. And I think the headhunters will knock no more about him moving to LBTH. 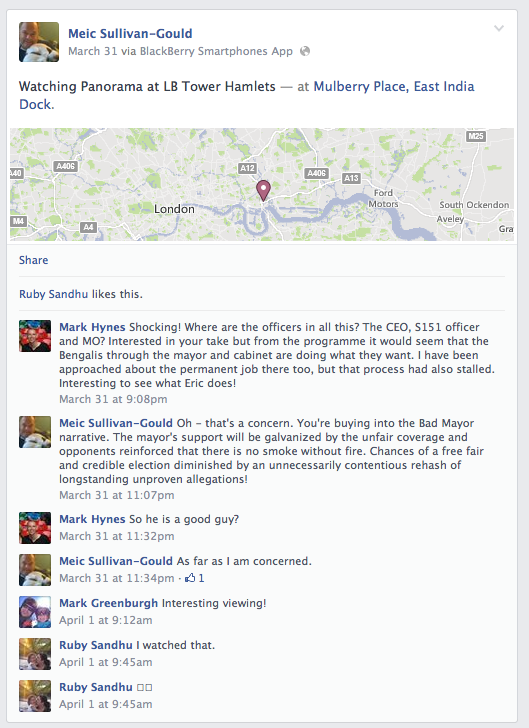 Remember, Meic had just watched a programme proving a dubious relationship between the Mayor and Channel S. Meic thought there were Chinese walls in place surrounding Mohammed Jubair’s work for the broadcaster and as a mayoral media adviser. 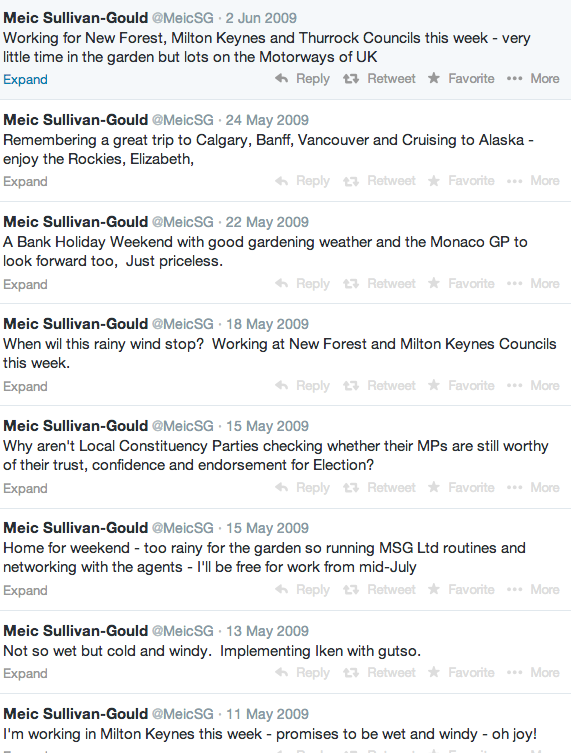 So in Meic’s view, Lutfur is not the Bad Mayor, but a good guy. Clean bill of health. Part of his job, of course, is to be impartial on many matters, and to retain the trust of members and officers. He may just have lost that. They almost yearn for the return of his predecessor Isabella Freeman. I’m not sure he can hang around too much longer. Or return to his thoughtful musings on Twitter..